“Everything flows and nothing stays,” said the Greek philosopher Heraclitus 2,500 years ago, aptly describing a healthy mantra for leaders gathering resources for a pre-seed organization to heed. Maybe your communications with an industry thought leader you met at an industry conference will lead to your advocacy on a prominent online investment platform. Perhaps an industry podcast host who interviewed you connects you to a high net-worth investor looking for a disruptive project like yours. If you are a business veteran, you already have a tight group of advocates who respect and enjoy your abilities to create value, and likely respect even more how you handled your past failings. Like the Greek philosopher’s observation, the internal compass guiding your decision-making should point in the direction of positive flow —especially as related to communications with the prospective syndicate of pre-seed investors you are curating to your ‘as idyllic as possible’ group of advocates. 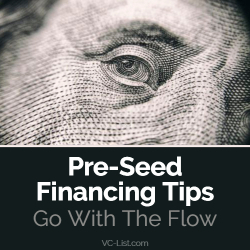 The path to pre-seed financing success is unique in each case and the path to liquidity is always longer than investors want. Thus, having the right patient pre-seed investors buying into your vision is critical. Equally critical is communicating with each one of your syndicate of buyers individually to set the appropriately conservative expectations regarding how long shareholders should expect some form of liquidity, and only if estimable, in what form(s) that liquidity should be expected. Setting appropriate expectations with each of your pre-seed investors— in writing, preferably email—is critical to minimizing future stressful conversations with the confused buyers with different expectations to your internal expectations. In a world of hyper digital communication, founders’ experience with an online investment platform to answer the same questions one time on an online forum instead of dozens of times has never been more joyous, as opposed to the ‘old way’ of a deluge of emails, texts and calls. What Is Your General Solution What do you envision the basic elements needed to fix your identified problem? How will the participants in your envisioned solution’s marketplace benefit? Total Available Market (‘TAM’ is the total possible envisionable universe of market size when your team crushes its ‘long-term’ plan)? Total Available Market is typically the most important market size question a prospective buyer will have as investor wants to know how much bigger market size your preseed organization can achieve from the initial market you are entering. What is your Serviceable Obtainable Market or immediate Market Share (‘SOM’ is the market size you think will define the size of your organization’s initial market universe post launch)? Show Competitive Advantages for why your organization will prosper (for example, team experience, marketing, usability). Be sure to make good use of colors and visuals but only use visuals if they better communicate the words on the slide. A picture/visual is worth a 1,000 words—but if the visual is mismatched, those 1,000 words will be negative! Show a visual or prototype of your product or service to enable the prospective buyers to get a glimpse of the vision you envision as your first version. A Competitive S.W.O.T. Analysis to provide ‘Strengths, Weaknesses, Opportunities, Threats’ of your closest identified competitors in your Serviceable Obtainable Market. Team Slides should include your key executive team members, your board directors and advisory board members. A key point or two relevant to each person can be especially useful. Provide press clippings, awards received, any sort of public realm third-party validation of your commitment relevant to achieving your vision. The above list of pitch deck ingredients are merely suggestions and as such should be integrated, reordered, ignored, and supplemented as you feel is appropriate for the platform audience you decide to work with to facilitate funding your pre-seed organization. Remember that your priority as the leader of your organization is to obtain the preseed resources necessary to build your vision to the next level of proving operational viability. Follow the path ‘where you are loved most’ in terms of prioritizing communications with the people who provide the most measurable benefit in the form of actual seed round purchases and firm purchase commitments. Keep open to changing your path and be ready for change to assist in keeping you balanced and prepared to be challenged by the perpetually unexpected. This is especially important during the infant years of your preseed vision’s lifespan. I wish you, visionary, the best of success! Anthem Hayek Blanchard is the co-founder and CEO of Hercules SEZC, co-founder, and CEO of AnthemGold, Inc and co-founder and CEO of AnthemVault, Inc. He has extensive knowledge in the cryptocurrency and blockchain space and a veteran of the seed round process from funding his three successful startups.